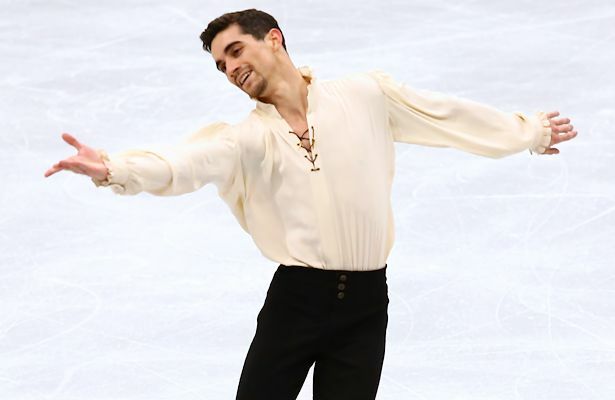 Spain’s Javier Fernandez performs his Free Skate at the 2019 European Figure Skating Championships. In what is to be his final competitive performance, Fernandez performed to “Man of La Mancha” choreographed by David Wilson. The 2018 Olympic bronze medalist landed a somewhat shaky quad toe-triple toe and later underrotated a triple flip, but was otherwise solid. He landed nailed a quad Salchow and two triple Axels, displaying good spins an footwork throughout. He finished first in the free skate (179.75) and rose from third to first overall (271.59). Performing to music from The Greatest Showman soundtrack, Samarin landed a quad Lutz, quad toe, and six triple jumps. His only major mistake was a two-footed triple loop and the 2019 Russian national bronze medalist was awarded a new season’s best of 177.87, a 17-point improvement from his previous score at 2018 Skate Canada. Rizzo performed to a Queen medley, opening with a strong quad toe. The 20-year-old went on to land eight more triples, however, nearly fell on a triple Axel. He earned level 4s on all spins and scored a new season’s best of 165.67 for a third-place finish in the free skate. With a total score of 247.08, he became the first Italian man to win a European medal in ten years (Samuel Contesti, silver in 2009). Kevin Aymoz of France struggled on several jumps in his routine to “In this Shirt,” falling on his opening quad toe. Despite the mistakes, he managed to land five clean triples and earned a level 4 on two spins and footwork to finish fourth (158.32) in the free skate and overall (246.34). He was fifteenth in 2017. Overnight leader Mikhail Kolyada of Russia suffered four falls in his free skate (11th) and slipped to fifth overall. Italy’s Daniel Grassl and Michal Brezina of the Czech Republic both pulled up to sixth (236.70) and seventh place (234.25), respectively. Sweden’s Alexander Majorov finished in eighth overall, while Alexei Bychenko of Israel and Morisi Kvitelashvili of Georgia rounded out the top 10. Russia’s Maxim Kovtun who stood in fifth, slipped to 14th overall.